We are full swing into the winter season and I wanted to share some super cute mitten and ear warmer patterns with you this week so you can have some winter fun this weekend. 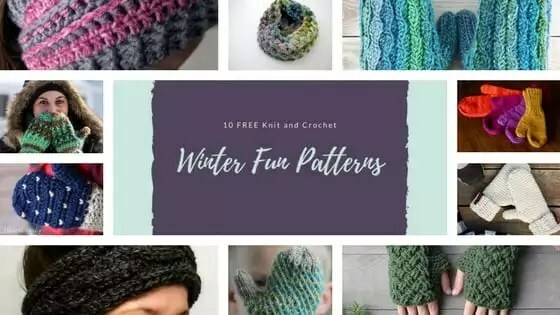 Check out these 10 FREE Knit and Crochet Winter Fun Patterns today. Get the FREE All Grown up Ear Warmer pattern on the Moogly Blog. This is a great stash busting project, change up the colors to make it for a girl or boy. Pattern also includes a video tutorial on how to do the stitches. Get the FREE Braided Hairpin Lace Infinity Scarf pattern. Pattern also includes a video tutorial on how to work hairpin lace. Get the FREE Celtic Weave Fingerless Gloves pattern. Get the FREE Minky Mittens pattern. Get the FREE Morning Mittens pattern. Get the FREE Nadia’s Wonderfully Warm Mittens pattern. Get the FREE Snowfall Crochet Mittens pattern. Get the FREE The World’s Simplest Mittens pattern. Get the FREE Winter Morning pattern. Get the FREE Wonderland Mittens pattern.